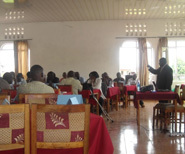 Public health management covers the administrative and managerial capacities, organizational structures, and systems needed to finance and deliver health services more efficiently, effectively, and equitably. 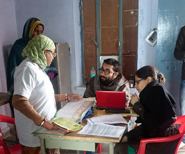 Sector Strategy and Planning— HFG works with partners to develop management strategies and plans, cost them, and then strengthen their capacity to use them as tools to guide decision-making and improve health system functions. 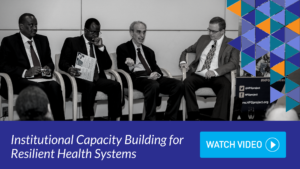 Institutional Capacity Building (ICB) — Without strong national institutions, health systems strengthening is likely to fail. 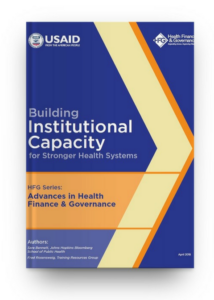 HFG has partnered with health system institutions in Benin, Burundi, Democratic Republic of Congo, Ghana, Guinea, Ethiopia, Mali, Nigeria and Peru to build institutional capacity, both at the organizational level and at the systems level. 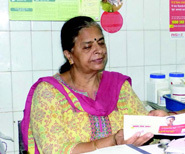 Digital Finance — Cash payments in the health system can carry security risks, increase vulnerability to fraud and leakage, and are often associated with high administrative costs and burdens. 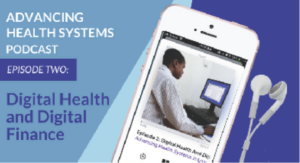 HFG published Digital Financial Services in Health 2012-2017: Lessons from Literature and Expert Interviews, which looks at DFS benefits to health systems, why the health sector appears to be lagging behind in DFS uptake, and what factors might accelerate DFS integration moving forwards. 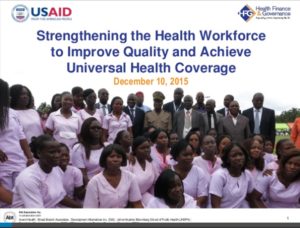 Public Financial Management (PFM) — Health systems rely on PFM to be effective, efficient, and accountable. 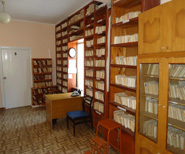 PFM includes planning, budgeting, funds flow, reporting, and risk management. 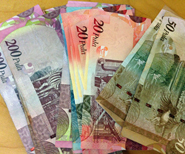 Working with its country partners, HFG has worked to help make PFM systems more capable and transparent. 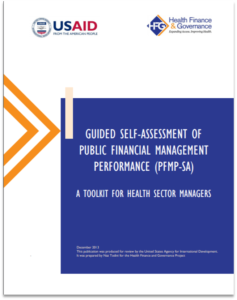 HFG’s Self-Guided Assessment of Public Financial Management Performance – A Toolkit for Health Sector Managers adapts the Public Expenditure and Financial Accountability assessment methodology developed and implemented by a multi-donor partnership including the World Bank and IMF to focus specifically on the health sector. 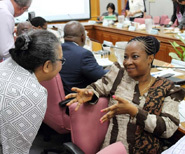 Human Resources for Health (HRH) — Achieving country commitments to UHC requires maximizing the efficiency and effectiveness of the health workforce. 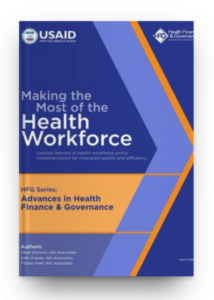 HFG has partnered with Cote d’Ivoire, Haiti, Peru and Swaziland to address many of the common challenges regarding HRH such as vacancies, ghost workers, incomplete HRH data, and health workers ill-prepared to meet population health needs, among others.